This Saturday, a touch of Southern hospitality is coming to New York City! 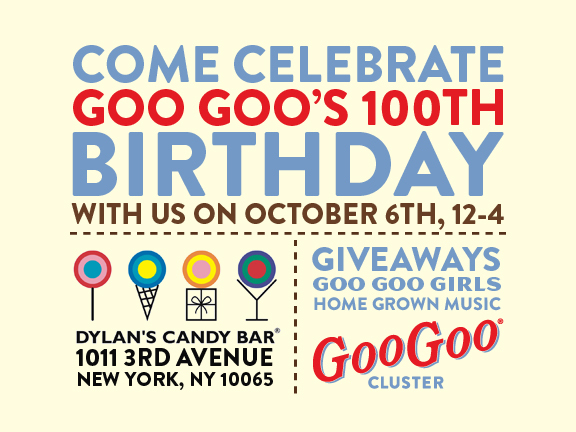 October marks a century of sweet success for Goo Goo Cluster, "The Original Southern Confection", and, in honor of the occasion, the Goo Goo Cluster crew is throwing a 100th Anniversary Celebration at Dylan's Candy Bar on October 6th. And, guess what. You're invited! It sounds like such a fun event. I wish I were going to be in the city so I could be there. Thanks to the amazing Beth Sachan, fellow food blogger and Chi Omega Sister, for letting me know about the event! 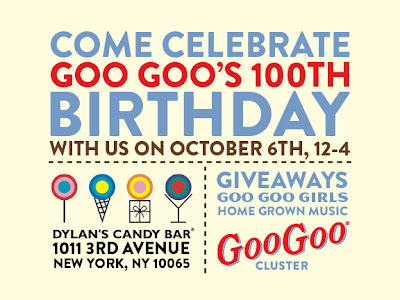 * If you're able to stop by Dylan's Candy Bar on Saturday, be sure to say hello to her for me! * Find Beth over at her blog Eat. Drink. Smile.